Social Media has completely changed the face of the internet. It’s also having a pretty substantial impact on the way we do business. Both things are positive in their own way and social media definitely brings a host of benefits in terms of ease of connection with your audience, ability to get your message out quickly and widely, and access to a vast amount of data and information. But, as with anything, there’s another side to the story. As the business world is increasingly encouraged to adopt social selling, social hiring and social networking, we at Tribal want to investigate the risks that inevitably go hand-in-hand with a social business. Our series of blog posts will cover the challenges faced by sales managers when employees are encouraged to use social media as part of their suite of business tools; the very real risks that come with this approach (and how to mitigate them); and tips and tools to ensure teams are fully engaged with the organisation’s policy on how and when to use social media in a safe and positive way. 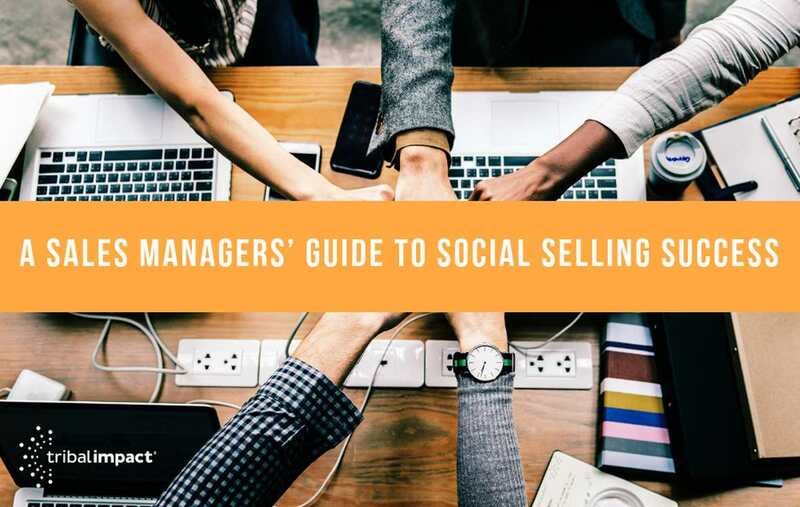 We’re starting where the buck stops: with a Sales Managers’ Guide to Social Selling Success. So, you’re in charge of a team of salespeople. Your organisation’s strategy is moving to a more modern approach to selling and you’ve been told that this is the year to focus on advocacy. As leader of a team, you might hear a few warning bells sounding from within a brief like this. Taking a business to a new, socially-focused way of working is not a small or quick change. Let’s delve in to some of the concerns you might have about your team putting this new strategy into play. What are these new methods? How do they work? Can we start from scratch or do they need to be phased in? Tribal Top Tip: Social Selling isn’t really something that can be mandated. People need to be open to using social media in the first place and adoption rates will vary according to the age demographic of your team. We suggest finding out who your natural early-adopters are and then getting them on board to share best practice and make others feel more confidence. This isn’t an overnight thing, it needs a carefully managed change program and lots of education and training. You could start by finding out whether your people are social hero or social zero by getting them to take our Social Impact Quiz. Well, that gives me some confidence, but what do you mean by ‘the right content’? Tribal Top Tip: Employee Advocacy and Social Selling are so much more than simply a powerful new tool. One of the key first steps to implementing a social way of working should be a Social Media Policy. This document will outline how the organisation and its employees should conduct themselves online. It should cover dos and don’ts, regulatory or compliance obligations, and expectations in terms of etiquette and conduct online. Here are some good examples. Your Social Media Policy needs to be a living document; it should be easily accessible and regularly referenced. It’s well worth putting a process in place to ensure people have not only read it, but understand it too. Our Social Practitioner Course is a good litmus test for understanding: it can be undertaken annually and people get a certificate to prove they’ve taken in the salient points. Your Social Media Policy can also help to identify appropriate content but the content tool should be the main source of finding appropriate material which can be shared without incurring risk to your corporate – and personal - reputation by falling foul of confidentiality issues. Sourcing content is one of the most time-consuming tasks that a sales person can experience when it comes to Social Selling. This is where employee advocacy platforms can help. Curators can feed third party and branded content into the platform so that sales can access and share from their mobile device. What’s more, they can track the performance of their content sharing to understand what type of content their networks engage with more. Easy to say but I don’t know much about LinkedIn, how are we going to focus on building our networks? Who should we be targeting and, anyway, people don’t seem to use LinkedIn for actual selling, it’s more about conversations. And what do you mean ‘getting the company name out there’? Didn’t you see that piece on the news about the KFC employee who talked about work on Facebook? Our legal team are pretty strict on this sort of thing, has anyone briefed them? Tribal Top Tip: There’s no doubt, LinkedIn is becoming the go-to platform for business networking. Having once been all about recruitment, it is now the place to find out about people and read thought-leadership style articles and blogs from those who are experts in their field. It also works the other way: if your employees work at building their profile and their network, they will see benefits in terms of their own professional brand and the career prospects. Using LinkedIn training should form a part of any employee advocacy training (which, to counter your other concern should also include educating people on the right way to go about advocacy), especially if your organisation is planning to invest in Sales Navigator licences. Well, that sounds promising but shouldn’t this be our first port of call? I feel like I need a lot of training, right now! Tribal Top Tip: There are many horror stories out there involving major brands who have been put at risk when an employee posted something inappropriate on social media. For businesses who embrace advocacy, it’s a very real and valid fear. Proper training, a social media policy and an advocacy program – not just a tool – with clear objectives and boundaries are all essential to minimising the risk of someone bringing your brand into disrepute. As this blog series continues, we’ll be getting into more detail on specific types of risk that can be encountered but there’s a good overview of the main ones in an older blog.